. In addition Action Coach has agreed to let us use their office space for our first two events. iness and personal brands and (2) To provide business networking opportunities for all participants. Generation Tech is currently looking for new committee members to join our team that work in the Information Technology or Digital Marketing fields that want to get involved with our team. If you are interested please contact Brian Gendron at bgendron@nocserv.com 281-529-5487. Generation Tech has two events currently on the calendar that are open to the public. If you are unable to attend, our events will always be live online and uploaded to Youtube. 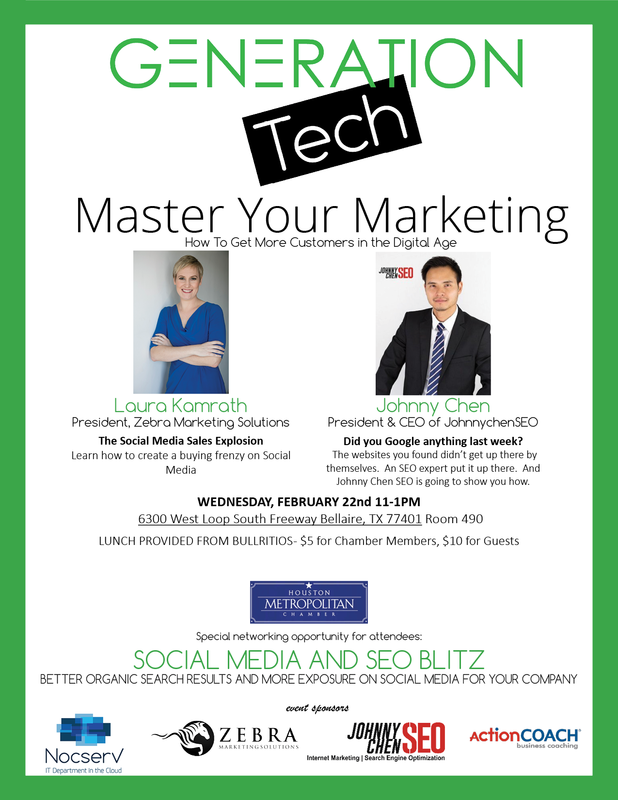 "Master Your Marketing: How to Get More Customers in the Digital Age"
PRESENTERS: Laura Kamrath, President and CEO of Zebra Marketing Solutions & Johnny Chen, Johnny Chen SEO. LOCATION: 6300 W South Loop S Bellaire, TX 77401.